They may say that they do not judge the email that they receive based on the subject line but this is not true. Some people will simply check out the subject line and delete the email if it does not appeal to them. An email marketer should make the effort to tests out different subject lines until they figure out a formula that works for their subscribers. You need to make your subject lines so compelling, so interesting that people cannot help but just click on it. Subject lines may be the shortest part of your email but it is one of the most important. It will determine if your email will manage to stand out from people’s already crowded inbox. Good thing that there are some tips that you can follow so that you can create subject lines that will just drum up people’s interest. l Keep the subject line short. The problem with writing long subject lines is that it will surely get cut off. Some may think that this is good as it would require people to click on the email to see what it truly has to say. A lot of times, people will not bother anymore. Create a subject line that is less than 50 characters so that they will be displayed properly. l Use a sender name that is easily recognizable. You can use your name on the sender’s address as it will make you easier to reach by your subscribers. Now is not the time to use the noreply@yourbrand.com. It will only make people feel intimidated. At the same time, they will not bother to add your name to the address book. This will increase the chances of your email going to the spam folder. l Always segment your lists. Creating email blasts can be very helpful for you because it is fast and easy but your subscribers may want different things. For example, you may offer fashionable items. People will not see any need to receive fashion trends for women when they are interested in seeing fashion trends for men. The tips mentioned above are meant to help you create subject lines that will make people open your email more. In today’ society, I wonder how many people give credence to the importance and benefits of a healthy and balanced lifestyle. 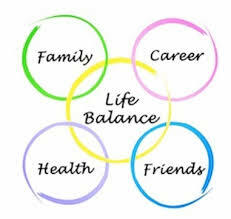 In my early 30’s, I feel like I’ve lost the sense of work-life balance. I feel like I’m moving yet, I’m not getting anywhere. I’ve confused motion with progress. Heaps of workload and deadlines keep on coming. I was consumed of how to get the things in my never-ending to-do list done.Just like most of us are, we make too many excuses because we believe we’ve got so much on. That sometimes leads to procrastination or ending up not doing the things that are important for ourselves because we’re too occupied of the present. This left me in deep thought how the culture of being busy becomes a trend nowadays. We sure have different purpose, goals, and priorities in life. We even have different frustrations, failures, and stresses in life. Finding balance may be a bit challenging, maintaining it is quite a different story. But life is very much of a balancing act.As Stephen Covey once said, the key is not to prioritize what's on your schedule, but to schedule your priorities.No matter how complex our lives would be, we must not forget that it is our responsibility to be well and healthy. Since we all have diverse mechanisms on how to deal with different aspects of our lives, we just need to find one that suits our lifestyle. Let us find time to reflect and introspect which areas are taking too much energy and try to put them into perspective in a way that would be beneficial to us. Let us be reminded that more than anyone else, we have full control over our lives. Not just a balanced lifestyle increases life expectancy, it also brings us contentment and happiness.There’s truth in this cliché, “never get too busy making a living that you forget to make a life.”Imagine how many more years do you have left in this world. It's pointless to exhaust all your energy for the things you want in the future when you have no one to spend it with when that time comes. Because you are too depleted building up your career that you give less or no time with your loved ones. I don’t want to regret in my later years of having experience the paradox of life. Enjoy life while you still can and most importantly, live a life with purpose. Vision is important when it comes to business ventures. Really great companies are often the work of a single visionary with the determination to bring an ideal to life. Many companies begin simply with a few ideas that the founder believes in with great passion. When a single person can translate their passion into reality and find others who share that desire, the result is typically a chance at huge success. Such is the case with Lime Crime. Like many other companies, it is about bringing a vision to life. The world of beauty is the hallmark of this company and it shows in everything they bring to their happy market of many fans across the globe. The company illustrates that success can come to life with certain qualities. People who are willing to work hard, choose a new way of seeing the world and provide value for the money are those who can help any company grow. Many women today are conscious of their own beauty routine. They look for ways to help themselves feel more beautiful. One way to do so is by using proven beauty products. This is why so Lime Crime has made so many fans over the years. The company has a vision that sees true value in beauty. Staffers here share the viewpoint of their clients. They are also on a journey to find beauty in life and find it the makeup they use. The products they offer to their client base are about showing that it is possible to find beauty in unexpected places. It's also about showing that everyone can share in the possibility of beauty in their own lives. When people buy their products, they're not just purchasing items. They're also participating in a much larger process that seeks to find beauty and marvel in its power. While having a vision and being able to work hard are increasingly important, all companies need to take another step. That step is to find working capital. Working capital is crucial for companies like Lime Crime. The use of working capital allows staffers to continue their process of experimentation and exploration. Working capital means that staffers here are free to spend time exploring their own personal inner creative soul. It also means that they can reach out to clients and see what motivates them. This is one of many reasons why those at Tengram Capital Partners have decided it makes financial sense for them to acquire a majority share in the company. They see true value in the company's overriding vision of the world of beauty. As a unique brand personality, Tengram Capital sees tremendous potential for amazing growth right here. Value for customers means that every one of their clients knows they can turn to the company to find something they like. The company's staffers are always on the lookout for ways to continue offer products that meet a client's needs. Fans know they can head to the company's site and discover new ideas about how to greet the world. They can not only anticipate trends but also help find ways to set them. This is in part why they have seen such an infusion of capital from Tengram. The capital provider sees value here just like their many clients. They believe that the company can continue to move forward with a vision in mind at all times. With this latest capital move, it offers a partnership that is mutually beneficial. The company benefits and so the company's clients and those at Tengram. 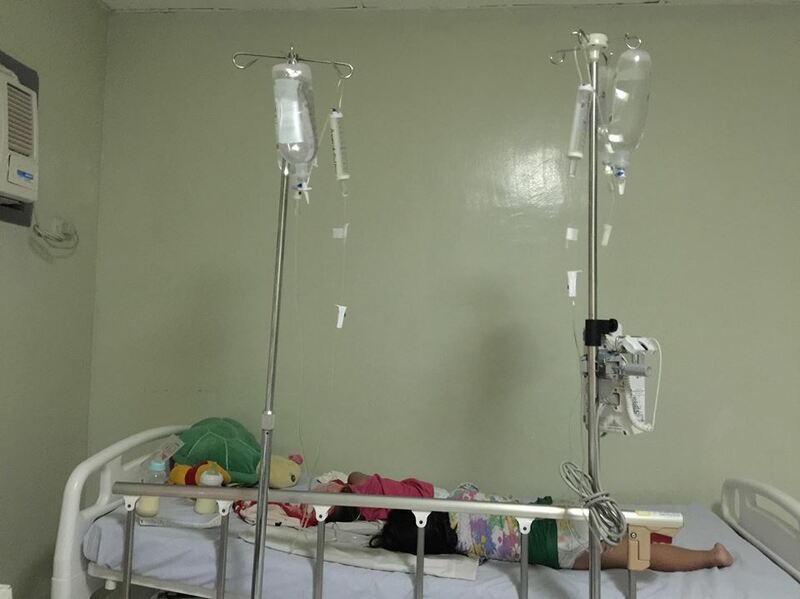 I am writing this for everyone to be cautious, alert and aware of the signs and symptoms of dengue; when to seek medical help and what are the stages of dengue fever. This article is only base on my understanding of the disease and actual clinical manifestation of my very own one-year-old daughter. How she overcome and won the battle. She is now recovering at home. She fought dengue for seven days. God is so good for answering our deep, sincere, and fervent prayer. 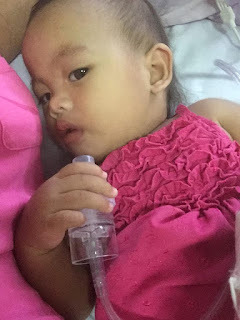 So now, I will tell you the story of how my daughter fought with this deadly virus. 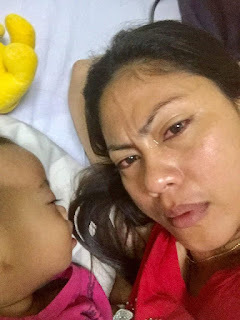 Around 2 am Oct 8, 2018; I noticed my baby was febrile, teary-eyed, weak and irritated. So, I gave her paracetamol for fever. Since I need to go to work that day, I asked hubby to observe and continue paracetamol every 4 hours. 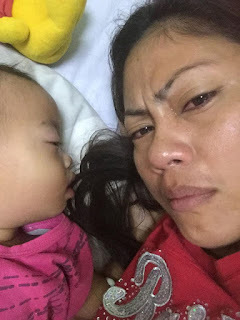 In the afternoon I received a text from hubby that the fever was not going down even paracetamol was given every 4 hours and our baby started to vomit and drink only a little amount of milk. We, decided to see a doctor Oct 9, there must be a reason why her fever won't go away. The doctor suggested admitting our baby. 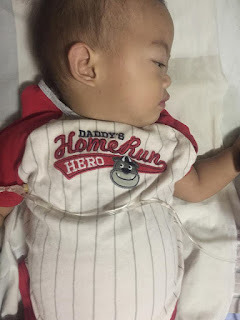 Still, my baby was febrile temperature 39.4. Since fever has not gone with paracetamol orally, paracetamol IV administered for faster effect. The temperature will go down a little bit and back to 39.4 again. I started to be very worried. I kept on thinking that she will be fine soon. I have two patients my two-year-old and my one-year-old baby. They both have pneumonia. The worst thing was, my one year old has dengue on top of pneumonia. Tip: if there is a persistent fever for two days, vomiting and body malaise, suspect for dengue although there are also many possible causes. October 10, 2018. Praise God for it was my baby's 1st birthday. We celebrated it inside our hospital room. I had only one prayer that day; Strength for my baby to fight the illness that she had and complete healing and restoration. My God, she is too young to experience all this. 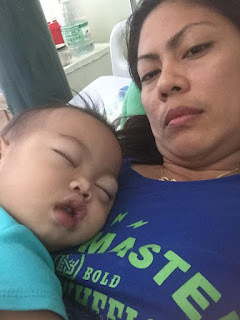 Fever was still there and I remained calm and always prayed for my baby. Happy 1st Birthday anak. Fight my love; we love you so much. 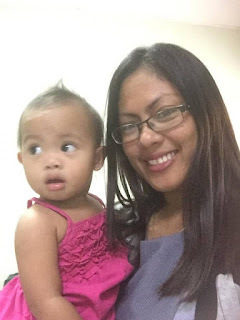 I started to cry out and asking my daughter to be strong. I was asking Ailee to fight and never give up. Can't hold my tears from falling. wake up nak! Lets play like our usual daily routine. It is on the third day that my baby was confirmed with Dengue on top with pneumonia. The platelet dropped from 172 to 50. Everyone was getting panic and nervous. We tried the tawa-tawa, magic ball, and igco milk, even these traditional medicine has no scientific explanation, but I least we tried. A lot of friends also suggested these. Thanks to my ever active and supportive sisters who were there with us from the first day until we got discharged. This day also that I noticed Ailee had puffy eyes and some edema in other parts of her body. 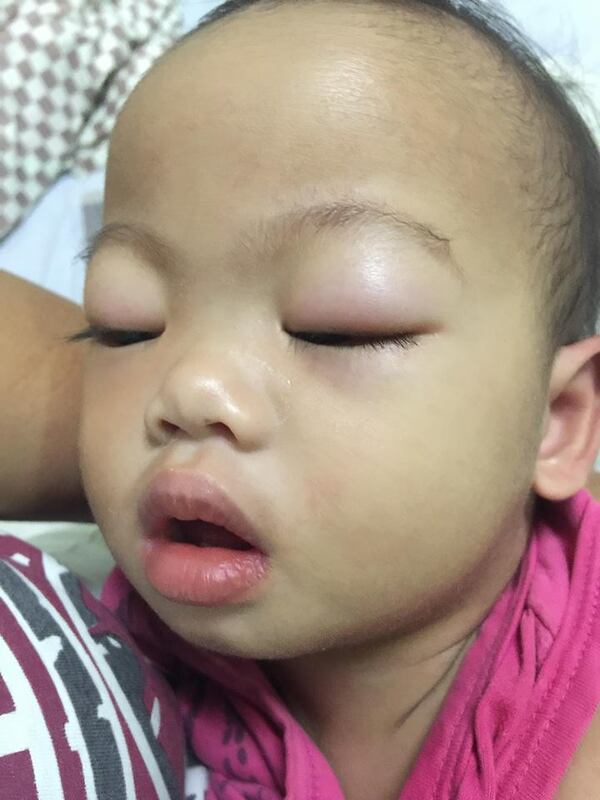 Yes, its a normal manifestation of patients having dengue. I'm so sorry my love. God loves you! just be strong! Aja! The saddest part was to see your baby asleep for 3 days, she only wakes up a few minutes and then sleeps again. In the same day, Ailee's platelet was dropped to 34 and then 21. I don't know what to do but remained strong despite the critical condition of my baby. The Oxygen ordered, but we got a hard time giving it since she got disturbed when she feels the air. There were nights when we didn't close our eyes for Ailee; we were to watch out any bleeding and difficulty of breathing. Thank God she fought the virus well. Diuretics was given to eliminate excess fluid and thank God; she's doing very well. This is the first day without fever. Thank you, Lord! hallelujah! My baby was improving! Second day without a fever! Thank you, Lord. Still, the platelet count was 38 but showing no signs of bleeding and other danger signs. This day that rashes appeared in both upper and lower extremities. She now became less irritable. She holds her own 'paaso' for her pneumonia. She can now tolerate foods. Thank you tita. Mango is so yummy. look at the camera Nak. 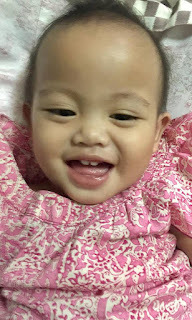 She is now free from the danger of dengue. Thank you so much, Lord. I can now smile again, and of course, my baby is now in a good mood. She will now play again with her toys and wanted to go down from the bed. She gained her strength again. Thank you so much, Father God. Look at that smile! 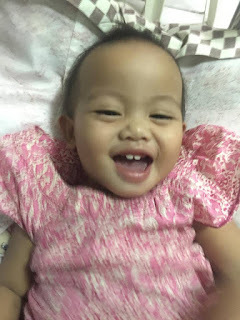 I miss that smile anak! Thank you, God for answering our fervent prayers. Praise God from whom all blessing flow. That smile is like nothing happened. Ailee is back to shape again. 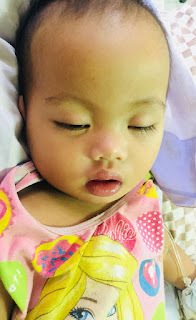 Let me take this opportunity to thank Davao Regional Medical Center especially to Ailee's consultants and resident doctors and for all nurses who took care of my baby. Thank you very much for everything. To my family who always there to support and back me up in all aspects, thank you so much. I love you all. To all who visited my baby in the hospital, thank you so much, your visit means a lot to us and to all who prayed and wish my baby well, thank you so much. 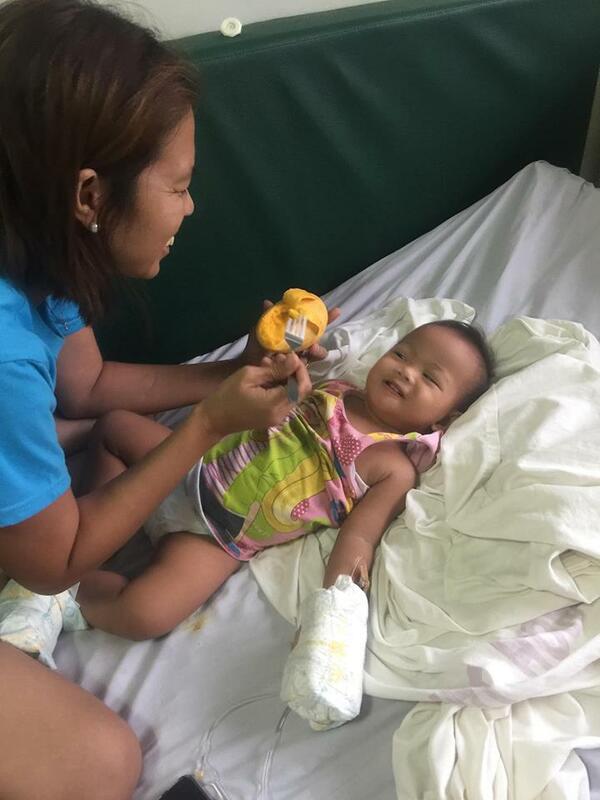 To those generous people who shared their blessing through giving, thank you so much. God bless you more! It is still more blessed to give than to receive. Thank you is not enough to say what's in my heart. My heart is jumping with joy. Above all, thank you so much, God, for answering our fervent prayers. Indeed! You are the God of a miracle. Thank you so many guys for reading my post. I wish you all good health and prosperity. God bless us all. When summer has sadly, regretfully come to an end and fall has arrived, it's time for you to switch up your skin care routine! A new season means new dangers for your skin. Drier and colder weather will affect your skin differently than hot, sunny days. Below you will find some helpful hints on how to take the best care of your skin during the fall season. Fall weather means you're skin will be exposed to some harsh, dry air. So in order to keep your skin fall fresh, you've got to make sure you moisturize! Fall is the perfect time to pull out a thicker, creamier moisturize for you face, as your skin will need all the hydration and moisture it can get. A good serum-based product can protect your skin from the fall weather as well. To make sure your skin is getting all of the benefits of your moisturizer it's important that you exfoliate your skin. Clearing away all those dead skin cells will allow your moisturizer to penetrate deeper into your skin. Your eyes and lips dry out faster than other places on your face. Always make sure that you carry around a good, natural lip balm that contains Sheabutter or beeswax. For your eyes, we recommend Genucel Eyelid Treatment. Not only will this treatment help with droopy eyelids by firming and lifting your skin, it will also make sure that the thin skin around your eyes stays moisturized. Genucel Eyelid Treatment is a completely plant-based product that contains miracle-working peptides that will refresh, smooth, tighten, and hydrate your eyelids. Most of the time good fall skin begins with not what we put on our skin but what we put in our bodies. A healthy diet can do wonders for your skin, and that means making sure that you're drinking enough water during the day. To restore your skin after summer has left it dried out, you can try health supplements. Fish oil rich with Omega-3s, fern extract, and zinc and calcium supplements can give your skin the right nutrients it needs to go through the rejuvenation process. Okay, hear us out this next one, but a humidifier is a great way to make sure that your skin stays fall fresh. Often in fall, the air dries out so much that it starts stealing moisturize from your skin. Running a humidifier in your home with restore much needed moisturize to the air and to your skin. When you want to get ready for fall, you need to do more than just break out all those pumpkins! Colder, drier weather and a weaker sun will leave your skin needing a little help in order to keep that glow you got in the summer. The best thing you can do for your skin is re-hydrate and moisturize all you can. When it comes to your eyes, the Eyelid Treatment by Genucel is the only way to go. Proven to tighten and smooth your eyelids, this treatment will leave you looking fall fresh. Jeunesse has delivered a top-notch solution to all of your mental stamina and focus needs with its revolutionary dietary supplement called M1ND. 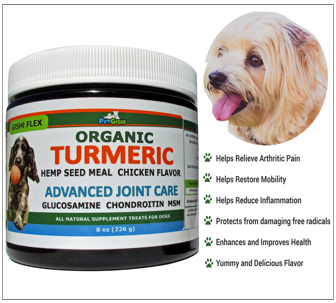 Its formula is based on the best focus and concentration techniques and herbs that Eastern medicine has to offer. One ounce of M1ND a day helps improve memory function and remove mental distractions. Customers from all walks of life are enjoying the benefits of M1ND in their personal and professional lives. Jeunesse created M1ND with the average adult in mind. For those of us who struggle with an always expanding workload and numerous demands in our personal lives, distractions seem endless. By taking this dietary supplement focused on improving mental functions, customers are enjoying the benefits of more intense concentration, which increases productivity and helps you feel more positive throughout the day. Rather than turning to habit-forming prescription drugs, Jeunesse customers are able to remember names more easily, think clearly and concentrate when it counts thanks to the benefits of M1ND. The secret behind the mental benefits of M1ND is that it is derived from a protein blend found in silkworm cocoons, CERA-Q. This transformative protein blend has been shown to support overall memory function when taken in the proper dosage and combined with a healthy diet and exercise. Clinical trials show that M1ND's formula can boost cognitive function without the use of prescription drugs and is generally safe for all customers. Jeunesse Global offers this formula in travel packet sizes so that you never have to go without the extra boost of confidence that M1ND can deliver to you on a daily basis. It is often the case that the medicinal or supplement products that work best are the least appetizing to consume. This is not true at all with M1ND. Jeunesse worked hard to develop a formula in a delicious lemon meringue flavor that is as enjoyable going down as it is when it's working at its best for you throughout a long and demanding day. This product can be used alongside the many other health and beauty supplements that Jeunesse offers so that you achieve a well-rounded version of health and happiness. Jeunesse has been delivering a steady stream of effective products ever since it was founded. It operates as a direct selling company and abides by the Direct Selling Association Code of Ethics in all of its business practices. Representatives who sell Jeunesse products are a genuine testament to their effectiveness and ability to improve your lifestyle. While some products offered by Jeunesse focus on helping you fight the effects of the aging process, others are designed to support efforts to live a healthier lifestyle through diet and exercise. Jeunesse has been consistently expanding the number of products it offers and has most recently branched into developing healthy, affordable makeup products that complement its successful skincare line. What makes Jeunesse's products so revolutionary is that they tackle the aging process from the inside out and do not just offer a temporary or outward solution to feeling and looking younger. When used collectively, the products developed by Jeunesse help improve your appearance and energy levels by addressing aging issues at the cellular level. Praise God from whom all blessings flow! 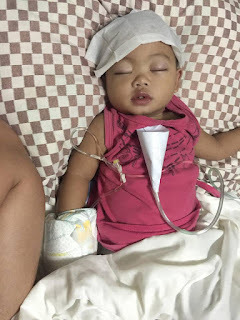 My daughter won the battle from dengue virus! When the time that I almost lost hope God is working miraculously and answering all our fervent prayers! Thank you so much Lord for giving us hope when we are about to be hopeless. Indeed, You are the great healer! Nothing is impossible to you Lord. My daughter’s platelet was dropped to 21 which is the normal is 150. Everyone got panic and of course cry is the only thing I did. I am weak but God is my strenght. He made me to trust Him more. Thank you so much for all the doctors and nurses who were taking care of my baby. 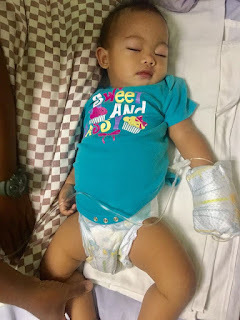 My daughter is a fighter! Thank you so much Lord. Now, we are ready to go home after 1 week of staying here in the hospital and critically battling the fatal dengue virus. It is important to have a good group of friends. Having friendships helps keep you emotionally and mentally healthy. In many cases, people are closer to their friends than their own family. It is normal for our friends to annoy us sometimes. However, there are some friends who have bad habits that can ruin our mental health. There are seven types of friends that you will need to avoid. People are human, so they may not be able to keep every promise that they make to you. However, if promises are repeatedly broken, then this is a bad sign. You do not want to be friends with someone who repeatedly breaks promises, but they expect you to keep yours. It can be entertaining and engaging to have a dramatic friend. However, drama is for reality TV. It is not for real life. You do not want to be friends with someone who is caught up in gossip and always spreading rumors. You also do not want to be friends with someone who always wants to be the victim. This can be toxic and emotionally draining. Moods can be just as contagious as the flu. If you have a friend who is in a bad mood, then you may be in a bad mood next. There is nothing wrong with allowing your friends to vent to you if they are having a bad day. However, if you are constantly around someone who is negative, then this can have a negative impact on your emotions. Small amounts of competition can actually be healthy. If you see your friend's goals and achievement as something that you can work towards, then there is nothing wrong with that. However, people who always want to be in competition with you are the ones that you want to avoid. They not only want to get what you have, but they also want to take what you have. Pre-teens and teens are often told that they have to watch who they hang around because certain people can be a bad influence. However, this is just as important for adults. You do not want to hang around people who are going to lead you down the wrong path. Fights are an inevitable part of a friendship. However, if you are constantly in conflict with your friend, then you will need to avoid them. Constant conflict can lead to depression. There are people who always need to have the last word. They also believe that they know everything. They may also belittle you and put you down. If you have a know-it-all friend, then this is a friendship that you may want to end. Talkspace is a company that provides online counseling. People will get counseling from the company by downloading the online therapy app. After that, they will complete an online assessment. The purpose of an assessment is to make sure that people are matched with a therapist that fits their needs. The next step is to choose the plan that works for you. The online therapy app has been praised because it provides people with a convenient and affordable way to get treatment.